Vesting does have something to do with employment (which at first sight must already sound a bit irrelevant to the solo startup founder with no employees, but believe me it isn’t, especially when you want to get funding) and something to do with equity and something to do with options and something to do with time and percentages and conditions. All of that sounds like it seriously needs putting into context, right? Want to see some truly confusing definitions? (don’t worry, well try and put this all in much less convoluted language once we get the ‘helpful’ examples out of the way). 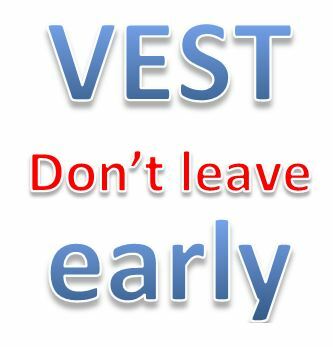 In law, vesting is to give an immediately secured right of present or future enjoyment. One has a vested right to an asset that cannot be taken away by any third party, even though one may not yet possess the asset. When the right, interest or title to the present or future possession of a legal estate can be transferred to any other party, it is termed a vested interest. The concept can arise in any number of contexts, but the most common are inheritance law and retirement plan law. In real estate to vest is to create an entitlement to a privilege or a right. For example, one may cross someone else’s property regularly and unrestrictedly for several years, and one’s right to an easement becomes vested. The original owner still retains the possession, but can no longer prevent the other party from crossing. Already confused as to how this applies to startups? Small entrepreneurial companies usually offer grants of common stock or positions in an employee stock option plan to employees and other key participants such as contractors, board members, advisors and major vendors. To make the reward commensurate with the extent of contribution, encourage loyalty, and avoid spreading ownership widely among former participants, these grants are usually subject to vesting arrangements. Notice what looks like a bit of a ‘circular reference’ at the end of that last sentence? You immediately sensed that the risk of the article leaving you seriously confused increased one thousand fold when the very next sentence has the word vests in it, right? The grantee receives an option to purchase a block of common stock, typically on commencement of employment, which vests over time. Does the Wikipedia article go on to clarify any confusion? The option may be exercised at any time but only with respect to the vested portion. The entire option is lost if not exercised within a short period after the end of the employer relationship. The vesting operates simply by changing the status of the option over time from fully unexercisable to fully exercisable according to the vesting schedule. Common stock grants are similar in function but the mechanism is different. All clear as mud so far? Vesting for startups is all about putting some special (and seriously weird) terms into the document (usually initially just a proposal) which is intended to carve up the rights to your startup, in exchange for some investment capital. Vesting is a term used in that document to define how you accumulate your rights over a period of time. If you agree to vesting arrangements (and investors like VCs will always expect you to) you will only get 100% of those rights after a certain time of being ‘employed’ in the startup. For example, let’s say that the document allocates a certain percentage share in the business to you. According to the terms of the deal, that share only becomes yours after four years ‘employment’ at the startup (don’t worry, we’ll get to why the seemingly inappropriate word ’employment’ comes into play here) your share is said to be vested over four years. The whole thing about vesting (from the investors point of view) is to set up an arrangement which reflects how long you stick around. This is why the otherwise seemingly irrelevant notion of ‘employment’ suddenly appears as a term is used to describe you, an equity holder and founder who (in every other sense) has no ’employer’ as such, rather than describing an ‘employee’ in the conventional sense. When you put together a funding deal, the funders want something in the terms of the deal which connects what it is that you are carving up (your rights to equity, stocks and shares, options and control) to how long you are going to be ‘making your contribution’ to the venture, so that you don’t disappear, because in a startup, much of the value of their investment is inextricably bound up with your unique and potentially irreplaceable capabilities, contribution and availability. But the special thing about vesting (and probably why there’s a special term for it) is because vesting takes your rights and makes them ‘time dependent’ or (for want of better ways to describe them) cumulative or incremental. Want to leave early? Vesting makes your rights shrink on a percentage basis. The earlier you leave, the less rights you keep. Put it another way, you only get all your agreed rights at the end of the vesting period (typically four years for startup deals) if you have stuck around all the way through to the end of the vesting period. But if you disappear early, you will only get the pro-rata proportion that is vested to you. Go after only one year (of a four year vesting arrangement) and you will only get a quarter, because you are only a quarter vested at that point, and they get the rest through buy-back arrangements detailed later on in the terms of the deal. In fact, in a vesting arrangement that is sometimes (if the terms are set out in a certain way) called a ‘vesting cliff’, if you leave before the first year is up, you will not be vested at al, you will ‘fall off a cliff’ and you will lose 100%. So, despite starting a startup in order to be your own boss and never be anyone’s employee, an investment deal essentially turns you into ‘your own startup’s employee’ from the other investors’ standpoint. Not only that, but it forces you (or rather ‘gives you a strong incentive’) not to go (and take your rights with you) whenever you please. “You can check out any time you like. But you can never leave” (early, that is, and not without a very serious hole in your vest). The book that is the most regularly recommended for anyone trying to gain an understanding of the background to negotiating startup investments is called Venture Deals by Brad Feld and Jason Mendelson and an extract from the part of the book which deals with vesting can be found here.